Our Adoptions Team is looking for volunteers to assist with weekend adoption events! 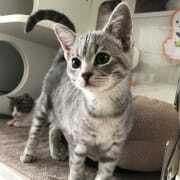 They need people to help set up and break down the adoptions table, help the Adoptions Coordinator to run the event, look after the cats, engage with the people interested in adopting. We are looking for people who passionate about animal rescue and are willing to do their best to help each cat find their forever home! If you join the Stray Cat Alliance Volunteer Team, you will learn about our mission, our programs and join our team of dedicated volunteers working tirelessly to find a home for each of our cats. Interested to volunteer with us in a different capacity? Email us at volunteers@straycatalliance.org!